The Tri-Oxy RE-ION and Tri-Oxy FRESH can be used to create ozonated water for drinking or cleaning purposes. If drinking ozonated water, please do so on an empty stomach. This is about 20 minutes before eating, or at least 2 hours afterward. You can ozonate distilled water for 10 minutes, and it will be fully saturated. Drink immediately, starting with four ounces, and work your way up to two liters. We recommend using the white stone to produce ozonated water for drinking. It has smaller pores that enable the ozone gas to dissolve more quickly into the water. If using ozonated water for cleaning vegetables we recommend using the gray stone diffuser, which is included with both the Tri-Oxy RE-ION and Tri-Oxy FRESH ozonators. The stone should be cleaned regularly. Learn how to clean the diffuser stone here. Adequate Ventilation: We recommend either turning on an exhaust fan, or opening a window, to get adequate ventilation when ozonating water. With the Tri-Oxy RE-ION, you may simply elect to run the Plasma generator whenever you are ozonating water. The negative ions produced by the RE-ION will attack poisonous positive ions in the air. 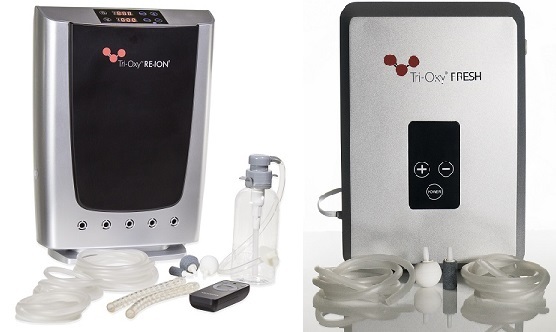 Shop the Tri-Oxy RE-ION and Tri-Oxy FRESH today!